Simon and I spent the last week in New York with my parents. They have the slowest internet connection in the world – even slower than those people who don’t even have the internet – and that is why I haven’t updated this blog in so long. It’s a quilt my mother asked me to make as a gift for a baby shower she is going to for an old family friend. My mom told me that the baby’s room was predominantly “mauve” (which can mean any number of pink shades to me) and that she really, really liked the last Sunbonnet Sue quilt that I made and maybe I could do something like that. Only she insists on calling my good friend Sue, “Holly Hobbie” no matter how many times I correct her. 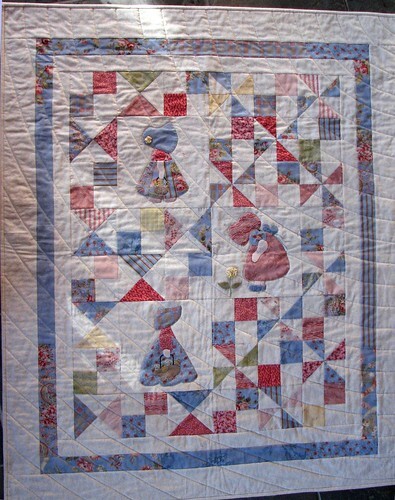 I told her at first that I just couldn’t commit to making her a Sunbonnet Sue quilt because the handwork took so much time and I had many other projects to work on. But then I started thinking about it and getting excited about fabric choices and quilt layouts until I finally just gave in and started on my little Sues. I got the patterns for the girls from 501 Quilt Blocks, a book I’m not super fond of although it does have many variations on Sunbonnet Sue. I altered the patterns slightly, because I thought they could be improved, but they’re still very close to the originals. All of the appliqué and embroidery of each Sue is done by hand. It really does look so much better that way. 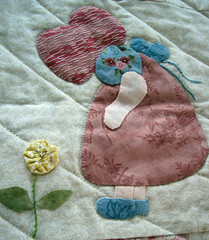 The layout of the quilt was inspired by Design Your Own Quilts, a fabulous book that I took out of the library. Unfortunately, it appears to be out of print. It’s all about creating the quilt as-you-go and not worrying too much about pre-planning. Of course, I still did some pre-planning, because I still need practice in letting go. I’m very happy with the result and plan on using this technique some more in future quilts. Stay tuned! 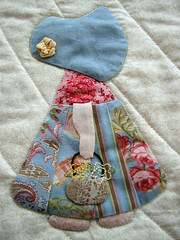 Your sunbonnet Sues are darling and very creative. I love your layout of the quilt. I haven’t seen one like it. Beautiful work.